Go to the Lookout in Ogunquit page to talk to us about condo 211, so that we can answer questions you may have. 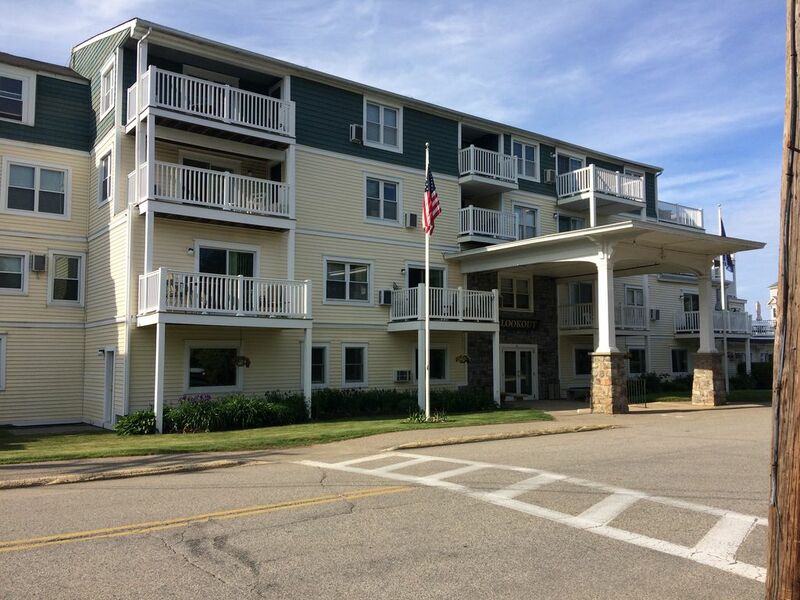 If you want the best location in Ogunquit, where you won't have to get in a car to get to anyplace to do anything, our condo is your destination. You can walk to everything in town, to the beaches, or to Perkins Cove, or you can take a trolley ride through town. A trolley stop is a block away. We are located between the center of town and Perkins Cove on the ocean side of Shore Road. Walk from our door a few steps to the ocean and Marginal Way, a one-mile scenic ocean walk with sandy beaches, cliffs, and benches from which you can enjoy all the views. Our little beaches on the Marginal Way are a 2-minute walk from our door, and you'll be at beautiful sandy beaches with picturesque cliffs behind you as you enjoy the sun and surf. At low tide, the little beaches connect to the town's unsurpassed 3 mile-long sandy beach. It is also an easy walk along the Marginal Way to town and the town beach. Walk the Marginal Way 1/2 mile to town to enjoy the shops, restaurants, movies, beach, or walk a 1/2 mile topppPerkins Cove to savor their restaurants, shops, galleries, fishing tours, sightseeing tours or to just relax and enjoy the magnificent views and working drawbridge. Our condo is at the Lookout on Israel Head Road off Shore Road in an upscale residential neighborhood with quiet streets conducive to walking and biking. On the first floor there is an elevator for your convenience, along with card-operated laundry facilities, and the on-site manager's office. There is a recently redecorated lobby and a community room with fireplace, library, cable TV, DVD and VCR player, stereo, comfortable chairs, and a dining room facing the ocean. Our grounds include: beautifully manicured gardens and shrubs, gazebo, tennis courts, playground, shuffleboard, picnic tables and grills, large, heated swimming pool with cabana, showers, recliners. There is parking for 2 cars for our condo. Our air-conditioned condo is on the second floor front and faces the pool area. From the deck you have a view of the ocean. The unit has been recently renovated with a totally new kitchen, floors, carpeting, bathrooms, patio door, everything. It has a huge bedroom with a pool view, queen bed and twin bed, 2 large dressers, bench, comfortable chair, glass cabinet and nightstand. There is cable TV. A full bath connects to the bedroom. The living room faces the pool and has sliding glass doors opening onto our ocean-view deck. There is a fullsize Murphy bed (it pulls out from closet doors) along with cable TV, DVD player and wireless internet access. The kitchen is fully equipped, including a dishwasher, microwave, and coffee maker. There is another full bath off the hallway adjoining the kitchen and living room. Pre and post season: June 1-21and September 7-October 12 by the week, for $950 plus tax and security. Summer season: from June 22-Sept. 6 by the week, for $1800 plus tax and security. We do not supply linens, sheets, pillow cases, towels, or wash cloths. No cleaning charge---our renters clean. Refundable security deposit of $400. Maine state tax is 9%. Lookout Condos may be the very best location in Ogunquit - the center of Perkins Cove, Marginal Way and downtown. These condos are part of an old hotel built in 1910 but have been modernized inside ( they are not posh but are perfectly adequate) and are a great home away from home. Unit 211 has a great kitchen, two clean bathrooms great air conditioning, great TV system with Netflix, and it's roomy inside. The only things you need to be aware of are 1) the occasional noise from neighboring rooms and hallway 2) the balcony overlooks the parking lot and pool instead of the beach 3) a small step up is required from hallway - due to leveling of the old floor - and corresponding small step down into one of the bathrooms. Once you've done this once or twice, this is not an issue. Weekly Rate: $800 - $1700 2018 RATES per week from June 2 to June 30--$800 + 9% Maine tax per week from June 30 to September 8--$1700 + tax per week from September 8 to 29--$800 + tax Renters do cleaning.